Since the opening of Swamp Cartography at Gympie in February I've been busy making new jewellery from this range to send around to stores. I've now stocked Pomme in Victoria, Sturt in NSW and Artisan in QLD with the above pieces. I'm enjoying making them and in teaching cuttlefish casting and etching workshops I have been freshly inspired by all the wonderful things that students have dared to try. Sometimes I wonder who is the student and who is the teacher! They come up with all sorts of interesting and strange ideas that I have learned to encourage because they often have fabulous results that defy my conservative expectations. 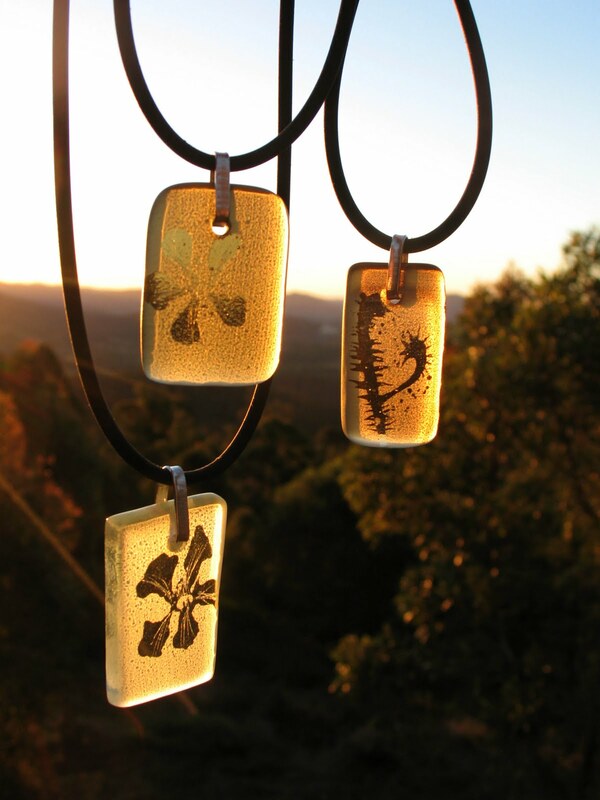 Wallum Glass Pendants- resist painted and diamond point engraved by Shannon Garson these depict delicate Leptospermum flowers and Forked Sundews on our subtle palette of recycled and new sandblasted glass. 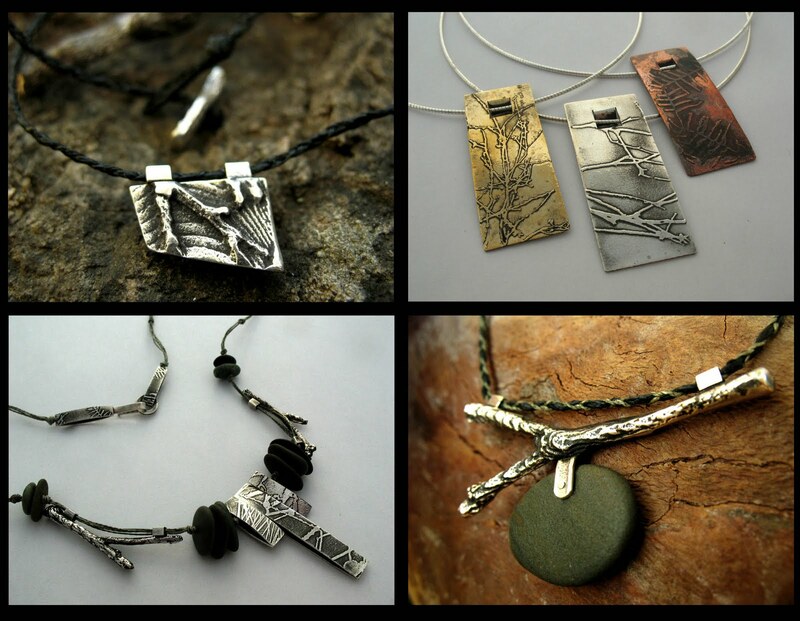 Shannon Garson and I have also sent off our Glass Wallum Pendants (above) to these places as well. It has been a slow start to the year with one thing or another and I am still getting used to life on a bush block away from services that you take for granted in town. However, we have just built a fantastic solar powered studio for my partner Russell Anderson with promises that mine will be next. I can't wait to move out of my dingy southwest facing garage which has few advantages in winter. Somewhere in the middle of all that a baby is expected to appear in October so construction timelines, not unlike my waistline, could get a bit extended! There is a severe thunderstorm warning issued for parts of the south east. Torrential rain and flash flooding. People are advised to take shelter. I wonder what is beyond that thick wall of water falling from the sky? Did I see a glimmer? 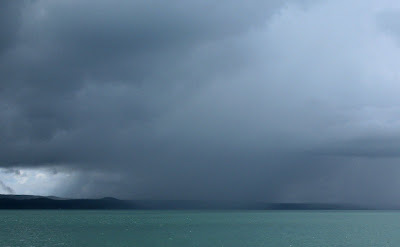 Underneath the storm is like walking under a waterfall into another world. 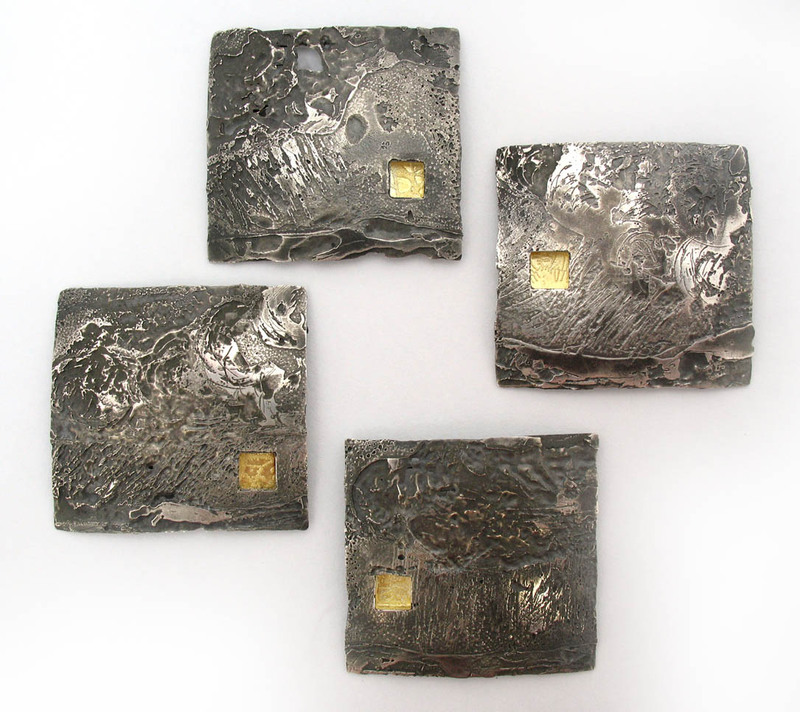 These 4 brooches about storms sweeping across the Wallum were created during the recent floods when we received about half a meter of thundery rain in 4 days and the side of the hill slipped away. Making them was difficult, the first batch lost to rising waters and when I was seperated from my etching bath for way too long. 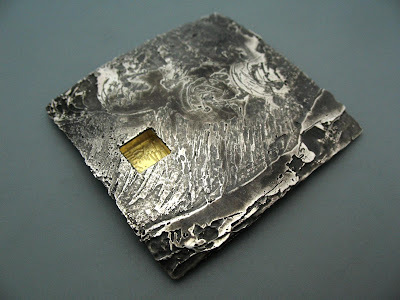 After that I was too careful with the etching and achieved conservative and boring results. Despondency. So I pretended to be a risk taker and put the bath in the hot sun which had finally emerged. Forgetting about it, I discovered these rugged results some hours later. 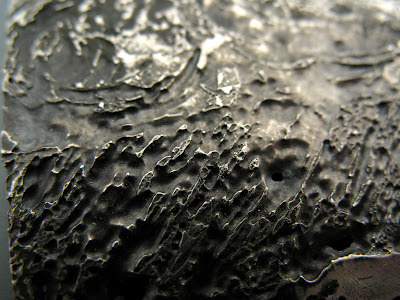 Weathered brooches. Eroded by the torrents of rain and beaten by the sun. Plucked to safety minutes before total disintergration. Due to a wash-out last weekend we cancelled our YDM stall because did not want to sit in the rain all day and have no customers. 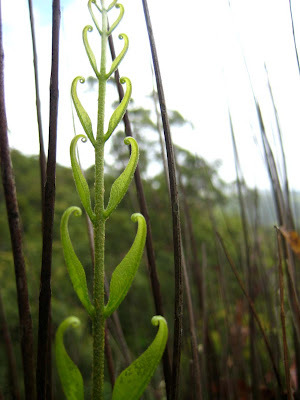 However we have found indoor premises for a show at the lovely Mt Cootha Botanical Gardens this weekend! Take that rain! 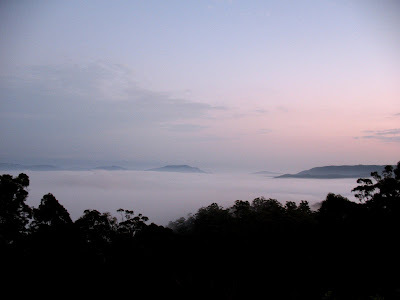 It has been such a wet year - in my new home in the clouds of Maleny we have had asylum seeker froggies hopping under doors and through windows at night to get out of the rain so you have to be careful where you step! You know it's wet when the frogs can't take it anymore! Because Shannon and I got rained out at the Young Designers Market last week we'd love you to come to our special Christmas event in Brisbane, undercover! 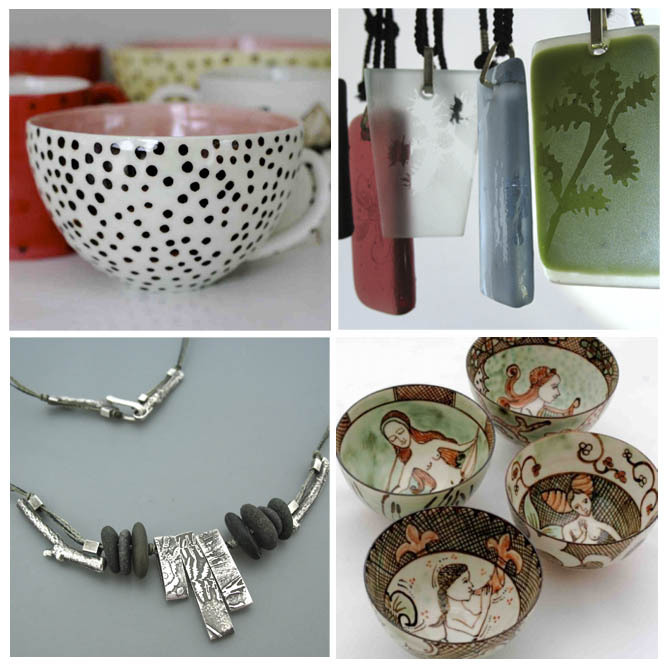 Our work will be on sale at the delightful Richard Randall Studio Gallery in the Mt Cootha Botanical Gardens this Saturday and Sunday 10am - 4pm. Drop in on Sunday afternoon for a mocktail and some lovely cheese and biccies with Shannon and I and Bettina Palmer, who has kindly invited us to exhibit. I'm sharing a one-off stall with Shannon Garson at the Young Designer's Market this Sunday. So if you are in Brisbane you should come along and support us! If you can't make it, perhaps you might pray to your deity for decent weather! 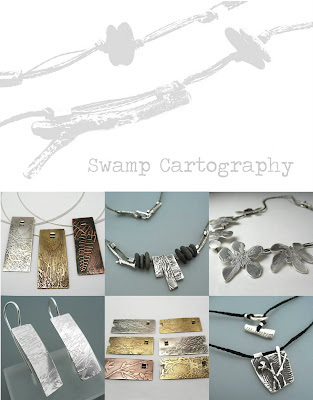 We'll have some of our new Swamp Cartography work there as well as some glass jewels, porcelain and other great giftage. 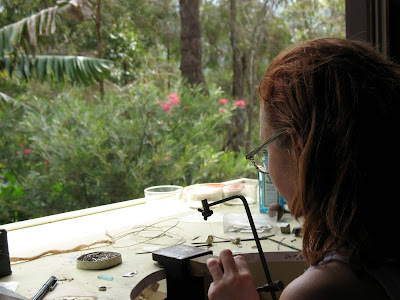 I just married sculptor and mechanical extraordinaire Russell Anderson, and moved to acreage near Maleny. 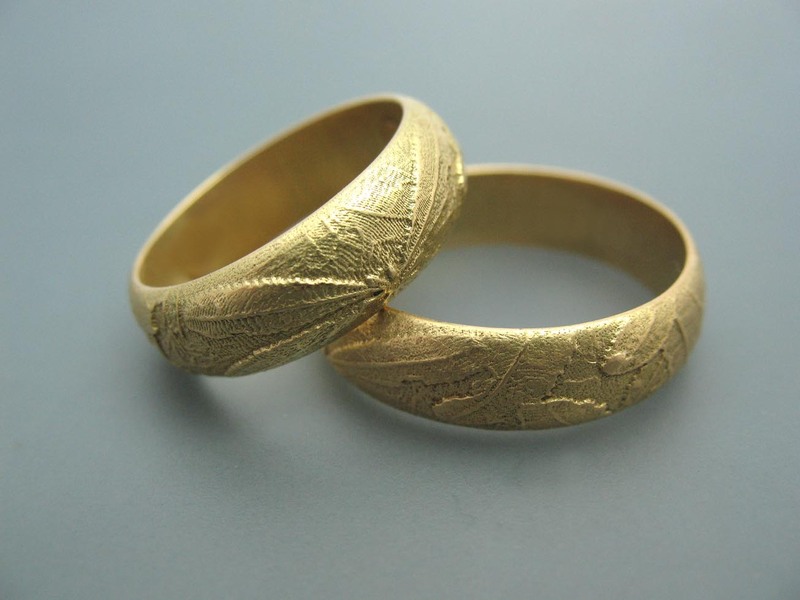 We decided to make our own wedding rings and we wanted something that reflected our shared love of botany and the natural world and combined my jewellery skills with Russ's skills in 3d modelling. 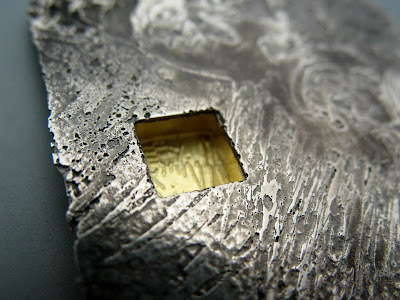 So we used rapid prototyping techniques and designed them (really Russ did all the slaving and swearing at the computer) and had waxes produced and cast in 18 carat yellow gold. 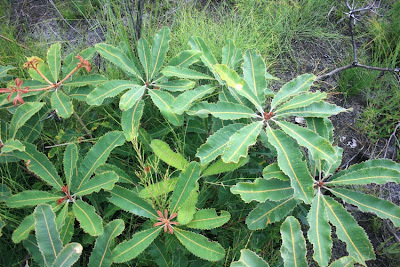 The original image was taken earlier this year during a visit to Cooloola National Park where a particular Robur Banksia (Swamp Banksia) caught our eye. 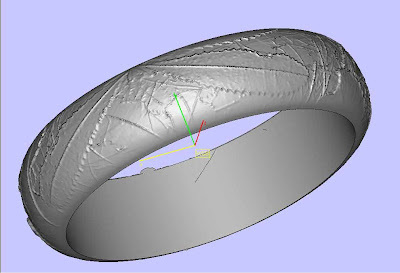 Russ was able to overlay the image onto a model of the ringshank. On the morning of the wedding foul curses could be heard as I hunted though packing boxes for tools to remove the sprues and sharp edges from the castings in my brand new studio! 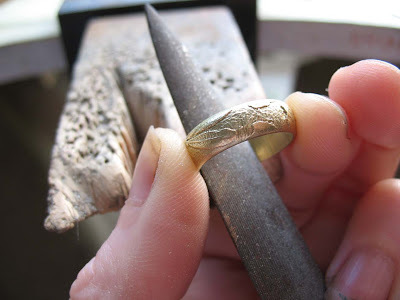 For a process so digital and printerly, the rings are satisfyingly heavy and tactile. Though the contour lines of production betray the method of manufacture, they echo the serrations of the banksia leaves and evoke cuttlefish patterning. When waking up to this inspiration in the mornings, it is important to have a jewellery studio with a great outlook. With this in mind, I have set up temporary digs in our garage which has the luxury of space and concrete floors, a step up from my previous studio. And I can watch the lizards and snakes basking on the gravel as I swat away at the relentless march flies (in the ointment). As we are on stand alone solar power, I have to take care to only use heavy consumption power tools on sunny days or in the mornings on wet days. Not too difficult as I hate working at nights! Now I can safely say that in my creative practice not only is all the silver I use recycled, but all the power is solar. Expect to see some new shoots. As the Australian sense of irony takes flight like a winged iced vovo, laminex boomerangs spin back to hit us in the neck. Some recent works on show at Marks and Gardner, Australian Icons Exhibition. "Once we found American flag-waving distasteful and 'over the top'. Now we try to out-wave, without having experienced the trauma of a terror attack on our soil to justify such displays of national pride and defiance." Anne Summers, challenging the adoption of 'Aussie, Aussie, Aussie, oi, oi, oi', as our international anthem, Radio National. Noice.